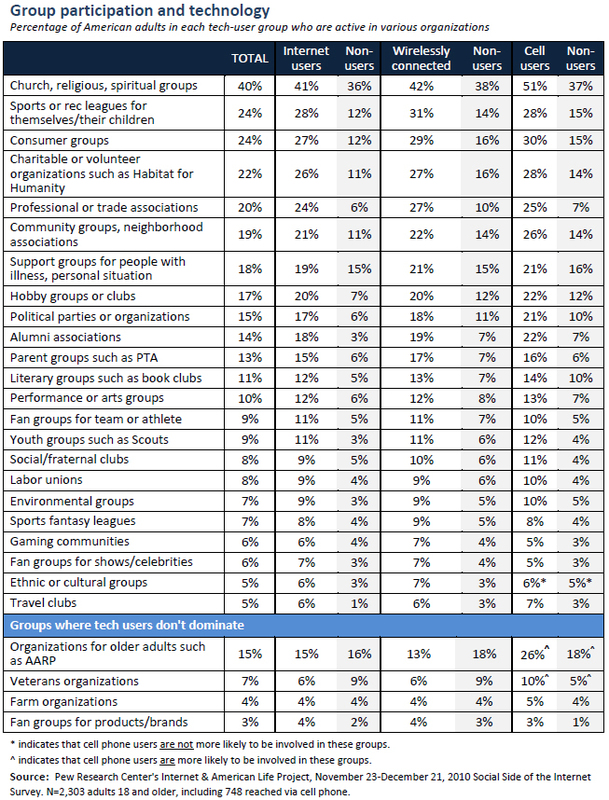 Across the board, technology users are more likely than non users to be involved in almost all the kinds of groups in the Pew Internet survey. Moreover, the internet is now deeply embedded in group activities and in how people create, join, participate in, and sustain groups. It is also implicated in the fluidity of group involvement as people sample groups, lurk in groups, and leave groups if they do not like the tone of group activity or the direction of the group. In this survey, 77% of adults reported being internet users; 81% said they had cell phones; and 59% said they connect to the internet wirelessly either through their laptop computer or through their smart phone. In the roster of groups we queried, available in the table linked to below, tech users dominated almost all the kinds of groups queried except those that are oriented towards older adults or based in rural communities. The proportion of American adults in each tech user group (those who use the internet, those who connect to the internet wirelessly, cell phone users, etc.) who are active in various organizations. From The Social Side of the Internet. As we noted, 75% of American adults are active in at least one group. This next segment of the report deals with that portion of the population: the Americans who participate in groups. For them, the internet has become as important as the phone and in-person meetings in holding groups together and keeping members informed of group news and activities. Some 77% of people report that the groups in which they are active organize activities and communicate with members via email and 69% report their organizations have a website. This is comparable to their reports about in-person meetings – 76% of them say their groups have regular gatherings – and phone organizing, which 70% report is a core activity of their group. In addition, 59% of group activists said their organizations send out printed newsletters and 40% host online discussions or message boards. As a rule, the younger a group member is, the more likely she is to report that her groups use electronic communication. For instance, 50% of younger adults say their groups host online discussion groups or message boards, compared with 41% of those ages 50-64 who report that. At the same time, those with higher household income and higher levels of education are also more likely than others to report that their groups rely on new media techniques for communication and information dissemination. For instance, 90% of those with college degrees say their groups use email to organize and communicate, compared with 69% of those whose schooling ended with a high school diploma. When it comes to having websites, 83% of those who live in households earning $75,000 and above say their groups have them, compared with 62% of those who live in households earning less than $50,000. 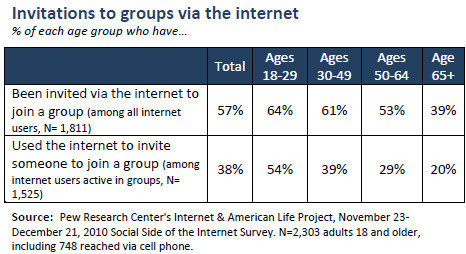 65% of the internet users who are active in groups say they use their groups’ websites. Younger adults and those with higher incomes and education are most likely to say this. 24% of these internet users say they contribute material to their groups’ online bulletin boards and discussions. Younger users are twice as likely to do this as people who are over age 50. The internet is also a key tool for mobilization and expansion of groups. More than half of all internet users – 57% – say they have been invited online and through email to join a social, civic, professional, or religious group. Some 38% of the online Americans who are active in groups say they have used the internet or email invite others to join groups. Younger adults, those ages 18-29 are the most likely to have on the creation end of those invitations and the receiving end. In the survey, we also asked everyone (internet and non-internet users alike) if they had ever personally created a group and 8% said they had. They were asked what type of group it was and the list was diverse: sports leagues, spiritual study and practice groups, book clubs, groups for political and social causes, ethnic clubs, literacy tutoring groups, organizations to help visit the sick and shut-ins, cycling clubs, prayer circles, fundraising events, health support groups, whittling parties, aggregators for arts and culture events, union locals, poetry reading clubs, ad hoc groups to help sick friends, mentor groups for at-risk children, protest rally groups, study groups for gifted students, quilting groups, alumni specialty groups, retiree clubs, painting circles, genealogy research groups, fan-fiction clusters, investment clubs, consumer consortia, bridge clubs and gaming sessions, car clubs, weight-loss groups, ex-patriot clusters, author-admirer clubs, and wine-tasting groups. Some groups come and go pretty quickly online. One of the hallmarks of the digital age is that groups can form and disband easily and it turns out that 9% of internet users say they have been part of a group that formed online and lasted less than a year. As in many aspects of online life, this phenomenon most frequently occurs among younger adults: 14% of the internet users between the ages of 18-29 say they have been part of a short-lived group that started online vs. 6% of the internet users who are over age 50. Of course, there are several reasons why the group might not have lasted and we did not ask the particular reason the group disbanded. New communications patterns have now been woven into group life. The activity at organizations and informal groups is increasingly taking place in social networking spaces like Facebook, on Twitter, in blogging, and in cell phone texting. This section will report on several subpopulations and their group activities, which tend to be more intense and more engaged than other technology users. In this sample, 62% of online Americans use social networking sites such as Facebook and 12% of internet users are on Twitter. Overall, 82% of those who use social networking sites are active in groups and 85% of the Twitter users are active in groups – in both cases that figure is notably higher than in the general population, where 75% of people are active in groups. The people who use those social media platforms often stand out in a variety of the types of groups that were covered in this survey. 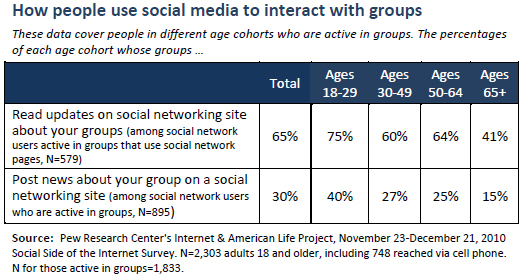 Not only are groups using social media to communicate and mobilize members, but the members themselves are often active in using social media to connect with the group and evangelize for the group with others: Some 65% of those who are social network site users say they read updates and messages on these sites about the groups in which they are active and 30% say they have posted news about their groups on their SNS page. The numbers are similar when it comes to Twitter users: 63% of the Twitter users who are active in groups say they read updates and posts on Twitter about their groups, and 21% say they post news on Twitter about their groups. Some 45% of the texters who are active in groups say they send and receive texts with other group members and leaders. 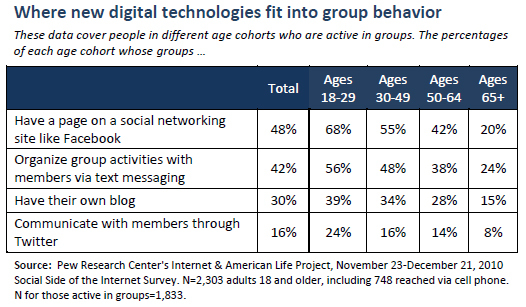 Again, younger group members are the most likely to have used technology in these ways. Compared with other technology users, those who use social network sites like Facebook and Twitter users are considerably more likely to be engaged with group creation and maintenance. Half of the social network users who are active in groups (48%) have used the internet to invite someone to join a group vs. 21% of the non-SNS users who have done this. Fully 65% of the Twitter users who are active in groups have issued invitations via the internet to others vs. 34% of the non-Twitter users who have done that. More than two-thirds (68%) of SNS users who are active in groups say they have been invited via the internet to join a group vs. 41% of non-SNS users who have had that experience. And more than three-quarters of Twitter users (79%) have been invited by another to join a group vs. 54% of non-Twitter users. 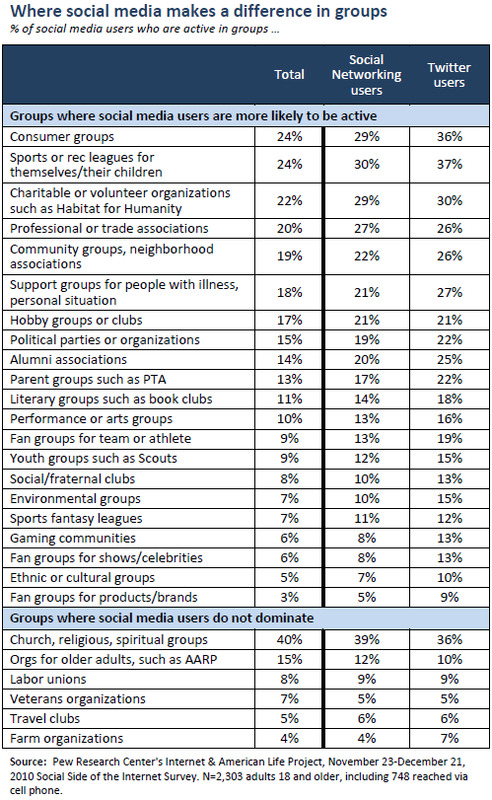 In a similar vein, SNS and Twitter users are more likely than others to have personally created a group. At least some of the groups that these social media users joined were the temporary sort. Some 11% of SNS users and 16% of Twitter users said they had been part of a group that had formed online and lasted less than a year, a higher incidence than for internet users who do not participate in those social media activities. Young adults. Those ages 18-29 are almost twice as likely as those over 50 to say they have felt obligated to join a group because of a friend’s invitation (23% vs. 13%). Higher socio-economic status individuals. Some 19% of those with college degrees say this has happened to them, compared with 10% of those who did not complete high school. And 19% of those in households earning more than $50,000 have felt this way, compared with 14% of those in households earning less than $50,000. Tech users. Some 17% of internet users say they have felt obligated to join a group because of a friend’s invitation, compared with 10% of non-internet users. The pattern is similar for those who connect to the internet wirelessly vs. non-wireless connectors (18% vs. 11%). Social media users. Social network users are considerably more likely than the internet users who do not use such sites to feel obligated to join groups (20% vs. 12%) and the difference applies to Twitter users compared to others (25% vs. 16%).